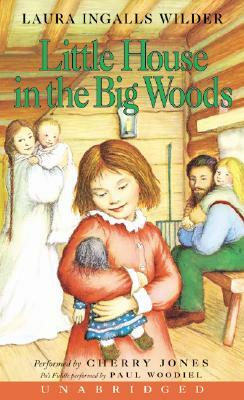 Told from four-year-old Laura's point-of-view, this story begins in 1871 in a little log cabin on the edge of the Big Woods of Wisconsin. Laura lives in the little house with her Pa, her Ma, her sisters Mary and Carrie, and their trusty dog, Jack. Pioneer life is sometimes hard for the family, since they must grow or catch all their own food as they get ready for the cold winter. But it is also exciting as Laura and her family celebrate Christmas with homemade toys and treats, do the spring planting, bring in the harvest, and make their first trip into town. And every night they are safe and warm in their little house, with the happy sound of Pa's fiddle sending Laura and her sisters off to sleep. Cherry Jones won the Tony® Award for best actress for both The Heiress and Doubt, and received two Tony® nominations for her work in A Moon for the Misbegotten and Our Country's Good; she can be seen in the films The Perfect Storm, Erin Brockovich, The Divine Secrets of the Ya-Ya Sisterhood, and Cold Mountain.